Jacks Peak County Park is a perfect spot for a day hike. 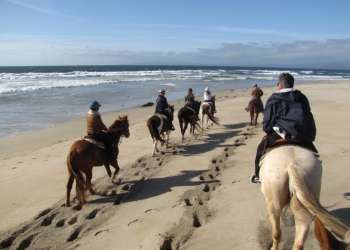 Located in Monterey, Jacks Peak County Park has fossils from the Miocene epoch, stunning vistas of Monterey Bay and Carmel Valley, and one of the only remaining natural stands of Monterey Pine trees in the United States. It is also a great spot for a picnic, with picnic tables located close to restrooms, some with grills. Jacks Peak County Park is celebrated by birders for the many species it houses and is part of the Central Coast Birding Trail. The views of Monterey Bay, Carmel Valley, and the Santa Lucia Mountains from the trails of Jacks Peak County Park are astounding. The hike to these breathtaking views, however, won&apos;t take your breath away; a parking lot near the top of the hill brings you close to the peak. Hiking at Jacks Peak County Park is much less strenuous than that at nearby Toro Park, and there are 11 trails to choose from. The 8.5 miles of trails at Jacks Peak County Park are mostly short hikes. See fossils embedded in the shale as you walk the Coffeeberry Trail at Jacks Peak County Park, and view other fossils in a display case on the Skyline Nature Trail. 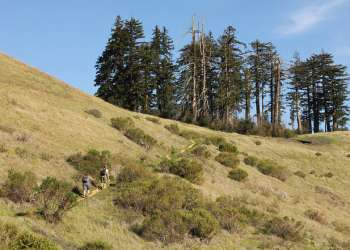 Refer to the online trail map at the Monterey County Parks website for more information, and refer to the first hike on our Top Ten Day Hikes in Monterey County page for details on the Skyline Nature Trail and Rhus Trail hikes. Read the blog for more information "Tales from the Trail: Jacks Peak County Park." Daily admission into Jacks Peak County Park is $2 per person and $2 per dog. Jacks Peak County Park has one picnic area suitable for groups of up to 50 people. It is available for events, including weddings, and alcohol is allowed with a permit. Call 831-755-4899 for more information. From Salinas and Route 101, take Route 68 West to Olmstead Road. Take a left on Olmstead, and follow it to Jacks Peak Road. Take a left on Jacks Peak Road. From the coast and Route 1, take Route 68 East to Olmstead Road. Take a right on Olmstead, and follow it to Jacks Peak Road. Take a left on Jacks Peak Road.